2 French verb tenses are used to express future actions: le futur simple (je mangerai) and le futur proche (je vais manger). French and English use is different for both tenses. In this article, I’ll go briefly over the constructions of the futur simple and le futur proche in French, explain when we use these two French future tenses, point out the differences of use between French and English, give you pronunciation tips and more. Le futur simple indicates that an action will take place some time in the future. Note that in French, we spell “le futur” without an E.
Also, there is nothing “simple” about the future in French… It’s just the way we call it! We don’t use any auxiliary to form the future tense in French. The verb endings will indicate the future tense. To form the future tense in French, we add to the infinitive of the verb (be careful: not the stem, but the whole infinitive, including the ER) the endings “ai, as, a, ons, ez, ont”. Note that the future endings look very much like the verb avoir in the present tense… It’s a good way to remember them for your French written test. (Note that the ‘s’ or the ‘as’ and the ‘t’ of the ‘ont’ are silent). Unfortunately, many verbs have an irregular stem in the future, and need to be learnt by heart. Good news though, the endings are always regular, so only the stem of the verb changes. In any case, you will always hear a strong R sound just before the ending in the French future tense. etc… There are thousands of French verbs and too many irregular verbs for me to list here. You will often have to check the spelling of French verbs in their various tenses, so you should really buy a French verb conjugation book if you don’t have one already. However, to master the modern pronunciation of the French irregular verbs, there is nothing like my French verb drills. Many French students kind of overlook the French future tense, because in books, it hardly covers one page! Just like I did right now, typical French methods will point out the conjugation pattern, and give you very little practice with this “easy” French tense. However, memorizing all these irregular verb stems may looks simple on paper, but coming up with the right French verb form quickly is one of the biggest challenges for students of French. So you need to practice! The best way to master the various French verb forms is to develop an ear for them and learn them in context so you really understand when to use that tense. Check out my French audiobook learning method À Moi Paris Level 5 and 6 for a clear explanation of the 2 French future tenses, and the level-adapted ongoing stories which illustrates them. Learn French in context! The modern pronunciation of the future tense is also very important: all your endings will start with an R sound. Je parlerai sounds like je parlrai. This is the pronunciation I use, the one used in Paris and in most of France, and the one I used in my French audiobooks. However, this is not true for all the regions of France: in the South of France for example, the “e” remains. Now, let’s study the near future construction in French. In English, le futur proche is a construction using the auxiliary verb “to be” + “going” + verb in the infinitive. I’m going to speak French. This is good news. The logic is almost the same as in English, so this tense is easy to build for students of French. You still need to practice though so it comes naturally to you… Understanding the logic is not enough to speak French with ease! In the negative, the “ne” and the “pas” surround the conjugated verb (so they surround aller). If you are using an object pronoun, the pronoun will go between the conjugated verb and the infinitive (so between aller and the second verb). Using the futur proche is more and more common in spoken French to describe events taking place in a more or less near future. Unlike English, the use of futur proche in French reinforces the idea that the speaker believes the action will become real. Je suis enceinte. Dans neuf mois, je vais avoir un enfant. I’m pregnant. In nine months, I….. have a child. In French, we would use “I’m going to have a child” in this context. Not so much because it’s in the “near” future – 9 months isn’t a really short time – but rather because it’s an upcoming change, something that we are almost certain is going to happen. In English, it’s more likely that you would say: “I will have a child” here. It makes it more real: it will happen = it’s almost a sure thing. In French, the futur proche is used for an upcoming change. The futur simple tends to be used for the consequences of this change. Dans neuf mois je vais avoir un enfant : je travaillerai à mi-temps et je devrai trouver une garde d’enfant. In nine month I’m going to (if I go for a literal translation… but as I said above, will may be more appropriate here) have a child: I will work part time and I will have to find a nanny. Note that you could also say “je vais travailler à mi-temps et je vais devoir…” Nothing wrong with this either. Quand je serai grand, je serai président = When I grow up, I will be president. Things that you seriously plan to do in the future, and are doable, but that are not necessarily in the process of happening. Un jour, j’aurai des enfants = one day, I’ll have kids. Otherwise we mostly use the futur proche, which is great news for students of French since the futur proche is so easy to use! 6 – Future Tense or Present Tense in French? Sometimes in spoken French, just like in English, if the future event is really close in time, we could even use the present tense. Tu finis à quelle heure ce soir ? = at what time do you end your day tonight? 7 – French Future Tense or Conditional? In modern French, the “je” form of a verb sounds exactly the same in le futur simple and the present conditional (the final S being silent). I just learned that traditionally, the “je” form of the future should have a “ré” sound and the conditional a “rè” sound. This was news to me, and I was baffled!! But most people agree that nowadays, they sound the same: see the discussion of wordreference. So how do you know the difference? Well, either you translate in English – which for once is going to be useful… The future uses “will”, the conditional “would”. However, many French people make that mistake in writing: using the conditional is so much common than the simple future that writing “mangerais” when “mangerai” is needed is a super widespread typo… I often fall in that trap! There is a huge difference between passing a French written test and being able to speak French… Understanding the logic and knowing the verb forms is enough for the written test. When you speak however, you need to know the right French pronunciation, with the liaisons and silent letters, and the verb form has to come fast. 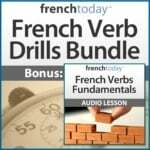 The only way to achieve that is to work with audio, even for your French verb conjugations! Then, learning your tenses within the context of the story will be a tremendous help to understand when we use the various tenses, and again, develop an ear and reflexes for the French verb forms. Books are OK for written tests. To speak, you need to train with French audiobooks. My French audiobook method A Moi Paris level 6 is set 10 years in the future of the ongoing story covered in the previous levels. You’ll get plenty of in context practice for the tenses of the future and past indicative.